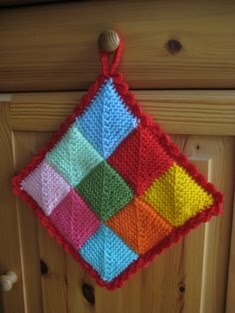 Last year, I learnt a new way (to me) of knitting a square from a book called 'Domino Knitting' by Vivian Hoxbro. It's a good way for me to use up bits and pieces of left over wools. My first project was a pot stand. It is now residing in my kitchen and regularly used.